The Chief Executive Officer of the Nigeria Stock Exchange, Oscar Onyema has called on African businesses to embrace higher governance standards to facilitate the inflow of funds needed to position the continent to leverage gains of the Fourth Industrial Revolution. 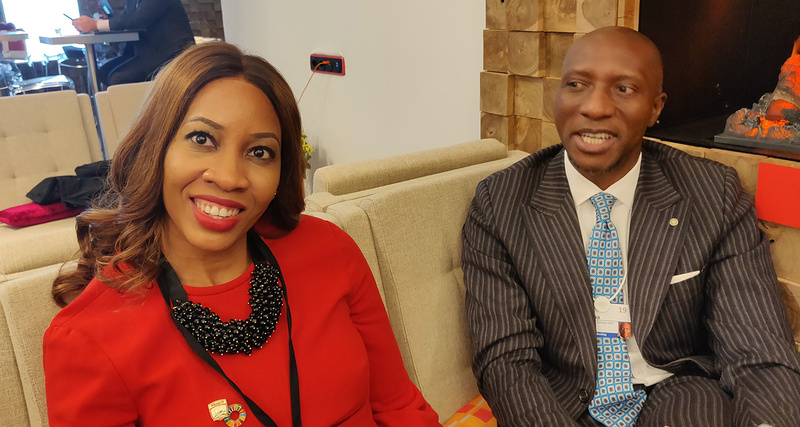 Onyema made the call at the ongoing 2019 World Economic Forum in Davos in an interview with Asharami TV, a Sahara Group thought leadership platform. Sahara Group is a leading energy and infrastructure conglomerate with operations in over 38 countries across Africa, Asia, Europe and the Middle East. The NSE boss told Asharami TV’s Pearl Uzokwe that the NSE had since established a governance regime that required premium companies to abide by globally accepted best practice in terms of its reporting, operations, processes as well as commitment to the Sustainable Development Goals (SDGs). He said the platform had inspired businesses to revamp their governance machinery, with particular emphasis on self-appraisals, peer reviews and continuing stakeholder engagement. L-R: Director, Governance and Sustainability, Sahara Group, Pearl Uzokwe and Chief Executive Officer, the Nigerian Stock Exchange, Oscar Onyema during an interview with AsharamiTV, a Sahara Group thought leadership platform at the ongoing 2019 World Economic Forum in Davos, Switzerland Tuesday, January 22, 2019. “The quest for good governance is now a global force that is driving the movement of investible funds and shaping the narrative for investors seeking to expand their frontiers. To adequately leapfrog into the Fourth Industrial Revolution, Africa needs to ramp up its level of digitalization and this would require huge funds. Good governance is now the only sure way to growth and the NSE is working with listed companies and other stakeholders across the globe to deepen compliance,” he said. Commending Sahara Group for playing a front-line line role in galvanizing private sector involvement in driving the SDGs, Onyema said the movement of talent, investment and goodwill is increasingly being determined by how much a business is committing to embracing Environmental, Society and Governance (ESG) tenets. “In addition to strong financial performance and profitability, businesses must be involved in enhancing the well-being of the world. There is no doubt that the only assurance that a business will be around for a sustained period will be a function of how invested they are in promoting the SDGs in collaboration with various stakeholders. It is exciting to see Sahara Group, an African brand leading this conversation on a global stage. AsharamiTV is live in Davos and continues to facilitate conversations on how the 4IR will impact Africa, amongst other issues at the annual forum that attracts world and business leaders and the civil society. AsharamiTV anchor in Davos is also the Director of Governance and Sustainability at Sahara Group.